St. Jospeh running back Jaden Shirden runs against Killingly during the Class M semifinals on Sunday at Trumbull High School. The Cadets’ defense limited Killingly (10-2), the defending state champion, to four first downs in the first half. St. Joseph scored on 5 of 6 possessions in the opening two quarters — and tacked on touchdowns on its first two series in the second half. David Summers completed 10-of-18 passes for 319 yards and four touchdowns. Providing Summers time were Robert Mihaly, Chris Kiley, Mark Arnone, Rich Licursi and Nick DiIorio. Jaden Shirden ran 16 times in the first half for 116 yards and two scores. He caught two passes for 85 yards and a touchdown in the third quarter. Brady Hutchison was the go-to guy for the Hogs, as he caught three first-half passes for 94 yards and touchdowns of 45 and 16 yards. Luke Kirby opened the scoring with a 30-yard field goal and was perfect on seven conversion kicks. St. Joseph led 10-0 after one quarter and took a 31-0 lead into the locker room. It was 45-0 after three periods. Nsaiah Harriet scored on a 2-yard run for Killingly, three plays into the fourth quarter. Luke Desaulnier kicked the PAT. 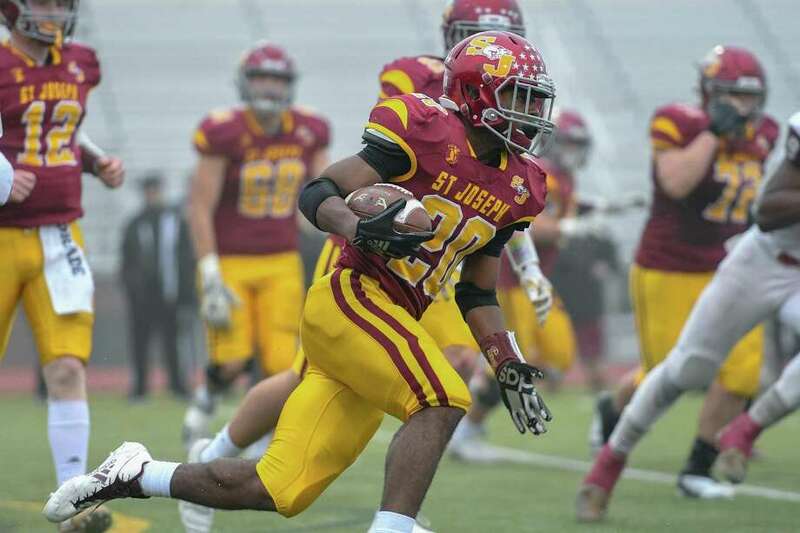 St. Joseph’s Darren Warren completed the scoring with a 40-yard run with 8:42 left. Kirby’s field goal put points on the board for the Cadets on their first series. Coach Chad Neal’s crew from Killingly mixed their play calling and moved the chains twice with Desaulnier completing a 12-yard pass to Quinn Gervasio and the 6-foot-4, 240-pound Harriet thundering for 9 yards on a 4th-and-inches play. The Hogs’ Alex Pagliarini, Cole DaSilva and Jesse Lawson made plays to force a punt. Shirden carried for 17 and 8 yards around an 8-yard run by Summers. Dylan Sanford sacked Summers for a 5-yard loss to the 45, but the Maryland-bound QB then had time to find Hutchison in space between defenders at the 14 and the sophomore ran the rest of the way to make it 10-0 with 3:20 left in the first. Sure tackling by Jermaine Williams, Warren, Mike Morrissey, Jack Wallace, Ace Luzietti and Cayden Porter stopped Killingly on its next two possessions, but a fumbled punt on the second gave the ball back to the Redmen at the Cadet 39. Davee (correct) Silas blew up a pass to Joshua Montpelier, DaSilva and Warren closed quick on a pitch out to Harriet, and Pagliarini made things difficult for Jackson Lopes trying the middle to force a second Killingly punt. Summers placed a perfect pass to Diamantis, who made the 50-yard reception while being tightly shadowed. A pass interference call brought the ball to the 14, where Shirden broke a tackle at the line of scrimmage and cruised into the end zone. Killingly had another empty possession, as Morrissey had a hand in on two tackles, including one that forced a fumble that went out of bounds. On 4th-and-one, DaSilva met Harriet in the hole and gave no ground and St. Joseph took over on the Redmen 29. Summers connected with Diamantis for 12 yards. On 4th-and-11, Hutchison was the outside receiver on a trips-right formation and ran under Summers 16-yard TD toss. That took the score to 24-0 with just under six minutes left until the break. Killingly put its best drive together here. Desaulnier completed passes of 5, 10 and 23 yards to Montpelier to help move the Redmen from their 20 to a first down at the Cadets’ 27. Williams forced Desaulnier out of the pocket and Morrissey was there to sack the talented junior for a 5-yard loss. Lopes took a pitch out and skirted the end on the same side the Cadets blitzed from to get those yards back. On 4th-and seven, Porter led a gang of tacklers and St. Joseph held on downs at the 19 with 1:42 left in the second quarter. Shirden then raced 81 yards for a touchdown to give the Cadets a 31-0 advantage. Dennis Elrod, Warren and Morrissey (on a reverse) made tackles to stop Killingly after the second-half kickoff. Summers completed passes to Shirden (9 yards) and Owen DaSilva (10 yards) from the Killingly 47. Shirden ran for three yards, before Summers hooked up with Diamantis for a 25-yard TD. DaSilva screened off a defender inside the 10, and it was 45-0. A Killingly punt gave the ball back. The Redmen blitzed on first down and the Cadets had the perfect play called — a screen. The line held the rush just long enough for Shirden to sneak out of the backfield. He caught the ball on the 30 and with a caravan of blockers raced across the grain for the 76-yard touchdown. That score came with 2:34 left in the period on the running clock. Harriet broke off a tackle-shrugging 37-yard run. Desaulnier then found Gervasio for a 28-yard gain that saw the senior receiver make a fine adjustment on the ball. Harriet scored on the next play. Warren had a 14 yard run off the right side, before taking the ball off left tackle for his 40-yard score.